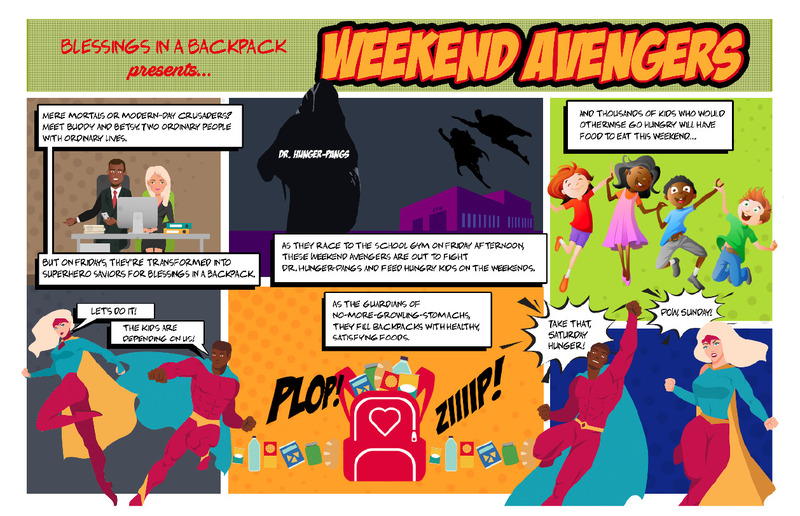 The Weekend Avengers from Blessings in a Backpack on Vimeo. Our society loves superheroes and their supernatural abilities, but what keeps us coming back are the human struggles that our heroes overcome. How beloved would Spider-Man be if we didn’t also see Peter Parker struggle to make ends meet, get the courage to ask out the girl he likes, and navigate the loss of a loved one? Without realizing it, superheroes tell us that ordinary people often do extraordinary things. 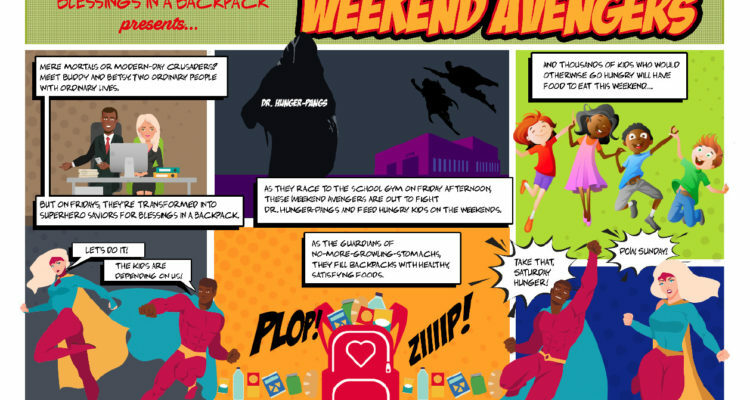 Volunteers and donors like you are the superheroes of Blessings in a Backpack—those committed to defeating weekend hunger. If you read the comic strip above, you know that Betsy and Buddy are part of a hunger-fighting team. They, like many of Blessings’ volunteers, seemingly ordinary. Every day, they go to work. And every night, they come home to unwind and recharge. But as the end of the week approaches, Betsy and Buddy go through extraordinary transformations, becoming heroes in the fight against childhood hunger. You see, as a Blessings volunteer, Betsy dedicates her time to ensure kids don’t go hungry. Working with local schools, she packs bags full of weekend nutrition that go home with kids in need every Friday. Because of Betsy, kids in her community don’t experience the hunger pangs that come with an empty stomach. Equally important to the Weekend Avengers are donors, like Buddy. 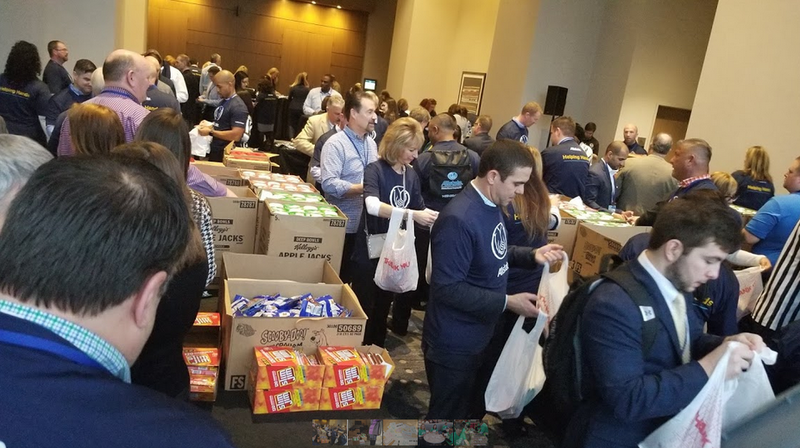 The kids receiving the Blessings bags might not know Betsy and Buddy’s true identities, but they know there’s someone out there looking out for them, heroes. 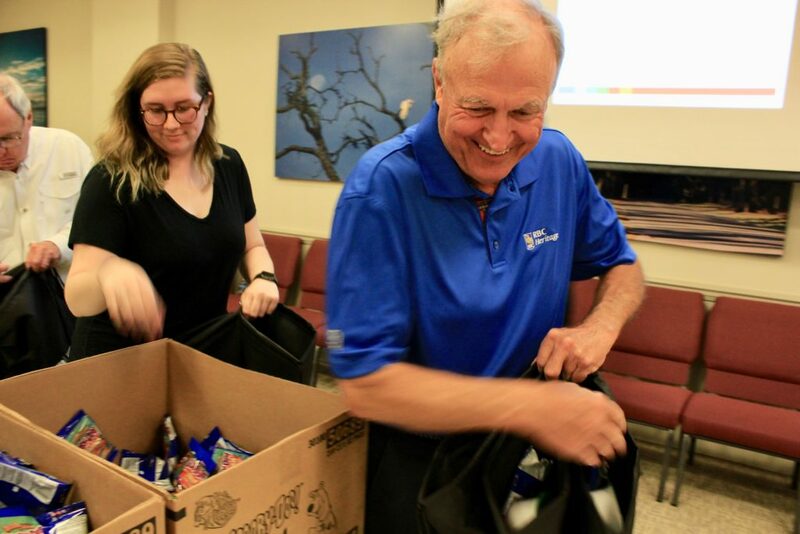 Will you join Blessings in a Backpack in our fight against childhood hunger? Click here to donate or click here to get involved.